At the heart of the accusations by mainstream country bullies that country and roots music must evolve to stay relevant is the insinuation that it isn’t evolving within the ranks of traditional artists, or that music can’t evolve and still include those strong ties to the roots that many traditionalists insist on. A similar conversation emerged when evaluating another recent release in the roots world called Turmoil & Tinfoil by bluegrass prodigy Billy Strings. What some characterize as impossible comes alive in very probable realization via artists who have both incredible respect for the roots of the music, and a strong desire to move the music forward to stay relevant to a modern audience. The Lost Bayou Ramblers—a very traditional Cajun-style band from Louisiana—has been both helping to keep the Cajun traditions alive in the ears of modern audiences, and trying to find new sonic frontiers for an almost ancient art form for going on some 15 years now. Formed around the nucleus of singer and fiddle player Louis Michot, and his brother, accordionist and lap steel player Andre Michot, this is not modern Cajun music meant to be accessible fare for passing tourists in the French Quarter. This is the authentic, archaic approach to Cajun and with the high, French-sung lyrics, genuine squeeze box melodies, and the Creole triangle helping to keep the beat. If you want to talk about dance music and its encroachment into every sector of American pop, consider that Cajun was one of the very first exclusively dance-oriented music forms born from the American experience, meaning music whose primary goal was to set feet to moving in waltzes and shuffles, and where passive listening was a secondary enterprise. An almost carnal infectiousness is at the heart of all true Cajun music, conveyed in its olden tones and instrumentation. 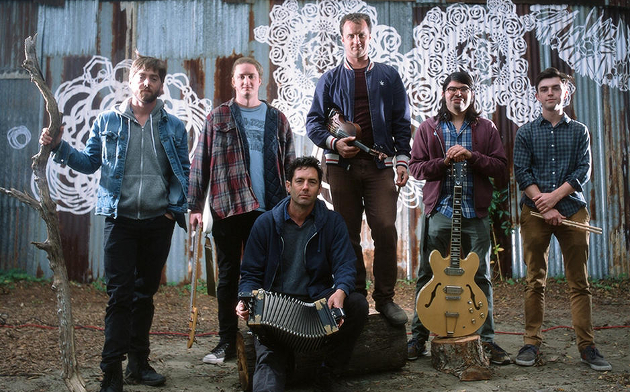 The Lost Bayou Ramblers have taken that idea to an entirely new level in their career arc, opening for acts such as Arcade Fire, and their last studio project, 2012’s Mammoth Waltz, comprising a collaboration with Gordon Gano, known best as the frontman for The Violent Femmes. Actress Scarlett Johansson also appeared on that record, and this newest record was produced by Korey Richey, known best for working with LCD Soundsystem. This speaks to the breath of respect the Ramblers receive. If all these names inspire trepidation in your little roots music heart that you’re in store for a weirdo electronic musical experience that you’d rather not be, you couldn’t be farther off. It is the authenticity and grounded adherence to the virtues of Cajun music in the face of so much modernization that make The Lost Bayou Ramblers so cool to the practitioners of music from an incredibly-wide panorama of genres. If Cajun music ever takes fire and becomes the next hot thing, sort of like swing, bluegrass, and traditional country have at times, you can be assured many will be pointing to the Lost Bayou Ramblers as a major influence, and one of the primary catalysts to creating appeal beyond the Cajun world. 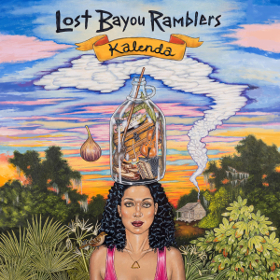 Yet don’t mark The Lost Bayou Ramblers, or their new album Kalenda as sensible or accessible. Though many may find the rhythm and accordion tones agreeable initially, when Louis Michot starts into singing in the French dialect, it frankly takes a specific mindset and understanding of Cajun music to be able to enjoy. That says nothing about if you translate the lyrics, and find that at times the message is politically charged, though on a song like “Freetown Crawl / Fightin’ Ville Brawl,” you don’t need Rosetta Stone to know what’s going on. It’s the forward-thinking textures throughout Kalenda that make it more than just another Cajun record. At times the band is willing to go on ambient journeys not traditionally allowed in the genre, and broach subject matter beyond Cajun’s established borders. Yet it is still so darn traditional and authentic at its heart, it’s hard to characterize it as some version of progressive music. Moving forward while preserving the past—that’s the challenge every roots artist faces, and the one the Lost Bayou Ramblers accomplish admirably on this record. Kalenda is quite striking, harsh in its tones and message sometimes, and certainly not for everyone. But in a genre lost in time and oft forgotten in popular music, yet so essential as a building block to melodies and modes that bubble up through most all popular music today, a musical journey with the Lost Bayou Ramblers—for those brave enough and willing of spirit—can be a fulfilling, enjoyable trek, however fey some of the twists and turns may feel. Always nice to see a review of a band from Acadiana. I have enjoyed the Lost Bayou Ramblers for years. In addition to the great music, I love the cover art on this on by Douglas Bourgeois. To me Cajun and Country music have always been interconnected going way back. The annual Festivals Acadiens et Creoles is this month in Lafayette, LA for anyone interested in a true taste of Cajun culture. The Ramblers are playing Oct. 15th. Oh, and RIP to the late DL Menard “the Cajun Hank Williams”. His tune La Porte en Arrière (The Back Door) was considered one of the top 100 Country songs of all time by Rolling Stone. Awesome! I’ve got a bit of trad cajun music in my rotation. Gonna check this out for sure! It may cost me an eye doctor visit. My wife’s eyes pert near roll out of her head when ‘c’est si triste sans lui’ comes on! But damn it sounds better than Zeppelin to me. What a groove. Do these guys have any relation to the Red Stick Ramblers? What’s the best way to purchase a band’s like this music, digitally (I have nothing that plays or rips a CD anymore)? Search them on Bandcamp, I just bought this on Vinyl and they have downloads available as well. As someone familiar with french canadian french. Their dialect is incredibly different. It sounds like a mix of old rural Quebec french and an anglophone speaking accented french. Creoles were the 1st generation offspring born in La .from European, prodominantly French and Spanish, immigrants. The richer aristocrats that lived in New Orleans so truthfully none were black. I seriously can’t force myself to enjoy the sound of the accordion. I’ve tried to keep an open mind but it’s just not for me. I’d spend endless hours listening to The Band and just wishing that damn accordion wasn’t there. Being an ignorant Alabamian, I try as much as I can to embrace other cultures. But, I just never could really grasp the Cajun style/sound. That being said, I gave these songs a listen and what I heard was really good despite that damn squeezebox. Maybe I’ll become a bigger fan with age or somethin. I will be keeping all you Cajun players (and your accordions) in my thoughts during the this next upcoming storm. Y’all stay safe and dry down there. Good tunes and good review Trig. The same Willie who’s first claim to fame was Blue Eyes Crying in the Rain? Love this stuff. Thanks for the review. I’m far from against innovation in traditional music, but the particular modern sonic flourishes on the song included here kind of take me out of the song a bit. Sort of Beausoleil meets Arcade Fire, or some such thing. It is a toe tapper for sure. Like most things Cajun, the sound and instruments are regional, my uncle from Eunice was an avid accordion player and played with many bands in the rice region where here in the bayou region near Houma/Thibodaux area it’s rare to have a band with one in it. went visit my grandparents up near Ville Platte but not so much here. Thanks for the review and attention to the band Trig. They have been making great music for awhile. If we think traditional country is endangered, try cajun and zydeco music. Talking about going into a career knowing you will have limitations…no radio, few labels, money’s tight and you play a circuit of fests and bars in Minnesota, Louisiana and few other stops, it’s hard to make a living. So these musicians are dedicated!